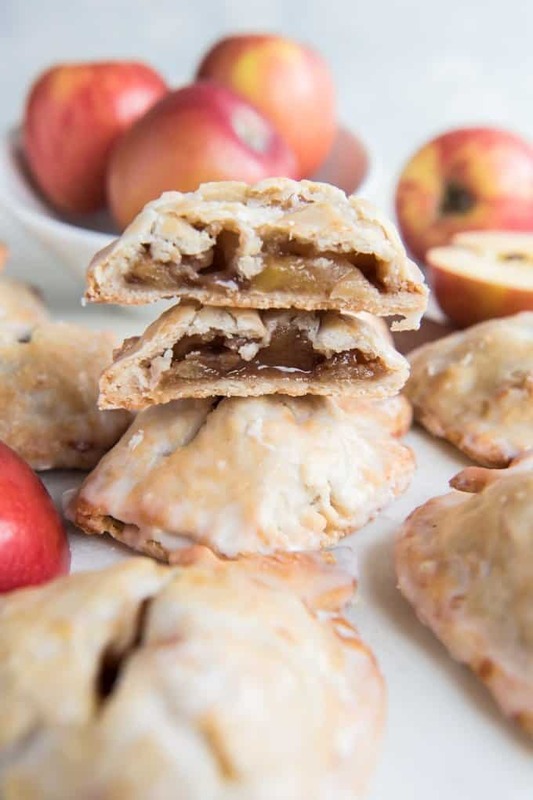 Glazed Apple Pie Cookies are like little apple hand pies that are the perfect for packing into back-to-school lunches for a sweet treat or for sharing with friends! Make everybody (especially teachers & students!) 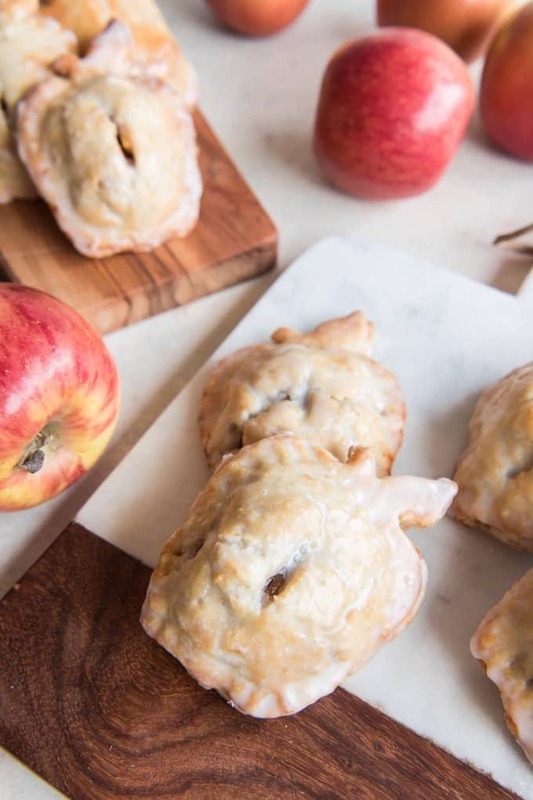 smile with these apple-shaped Glazed Apple Pie Cookies! Nothing says Fall to me like homemade apple pie and I am ready for Fall despite the 100+ degree temps we’ve been having so far this September! 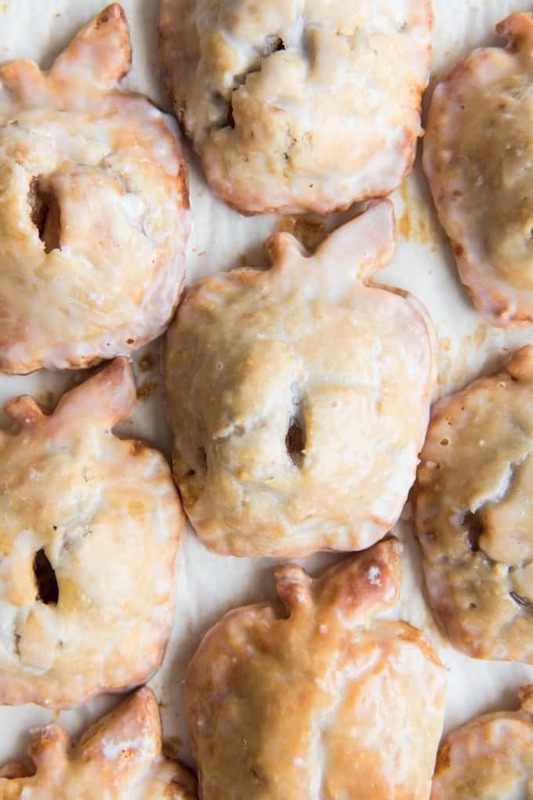 These Glazed Apple Pie Cookies are everything you love about apple pie, except bite-size. And shaped like actual little apples thanks to a cookie cutter. 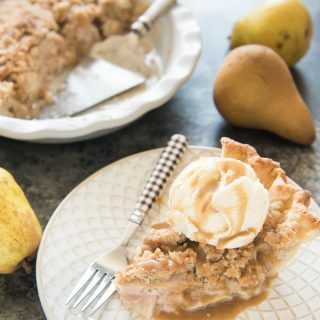 Could you use store-bought pie crust and canned apple pie filling? Weeeeellllll, yes. You could also just buy these Hostess Apple Pies that I remember from my childhood school lunches. I’m not going to diss on them because I loved those things when I was a kid! But that’s not why you’re here, is it? I at least recommend that you make the apple pie filling from scratch with fresh, seasonal apples. Yeah, yeah, I know it means some peeling and chopping is involved, but c’mon, we all at least kinda’ like to cook here anyway, right? Or have aspirations in that regard, yes? And making the perfect pie crust isn’t as bad as it seems. Give it a try! Hostess Apple Pies ain’t got nothin’ on homemade apple pie cookies! Don’t overfill – 1 Tablespoon of filling per apple pie cookie should do it. 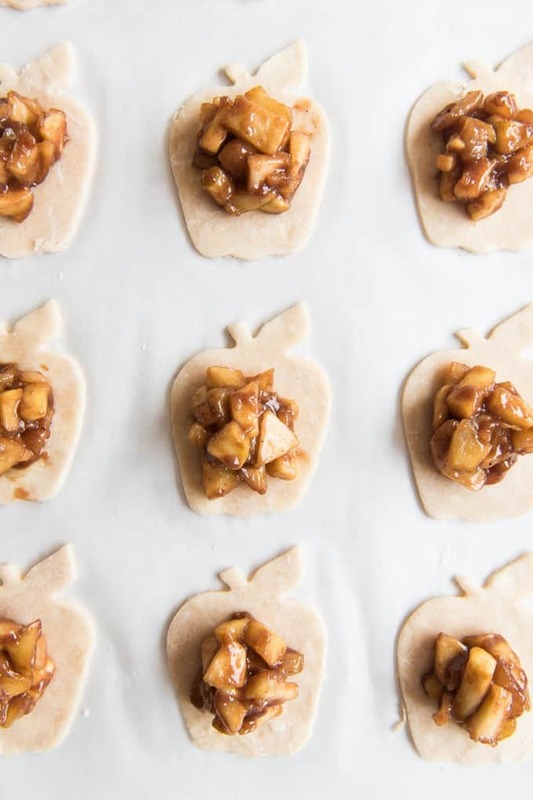 You are going to be cutting out 2 apple-shaped pie crusts for each cookie – one for the top and one for the bottom, and the top one is going to need to stretch a bit to cover the apple filling. Too much filling and you are going to have a hard time sealing these babies up. I would warn you that these cookies are not for people who only eat the filling and leave the pie crust on the plate, except that’s typically my husband and he raved about these. It’s the glaze. It takes the already delicious crust to all new levels of awesome as it sort of becomes part of the crust. Make your pie crust and be sure to chill it for at least an hour in the fridge. It really does make a big difference! 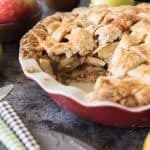 While the pie crust is chilling, make the apple pie filling by dicing your apples smaller than you normally would for apple pie. Then you are going to pre-cook your apple pie filling a bit in a pan on the stovetop. 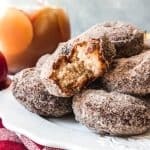 They soften up and release their juices in about 5-10 minutes with just a little butter, brown sugar, and some cinnamon, nutmeg, and a little salt. Then you thicken the filling with just a bit of flour so it doesn’t run everywhere when baking the hand pies in the oven. After giving the chilled crust a few minutes out of the fridge to thaw just a bit, roll it out like you would a normal pie crust, except use a cookie cutter to cut out a bunch of darling little 4-inch apples! You can combine and re-roll scraps of pie dough until you use it all up. Yeah, the last few might not be quite as tender or flaky as the ones from the first roll, but nobody is going to care once they get glazed. 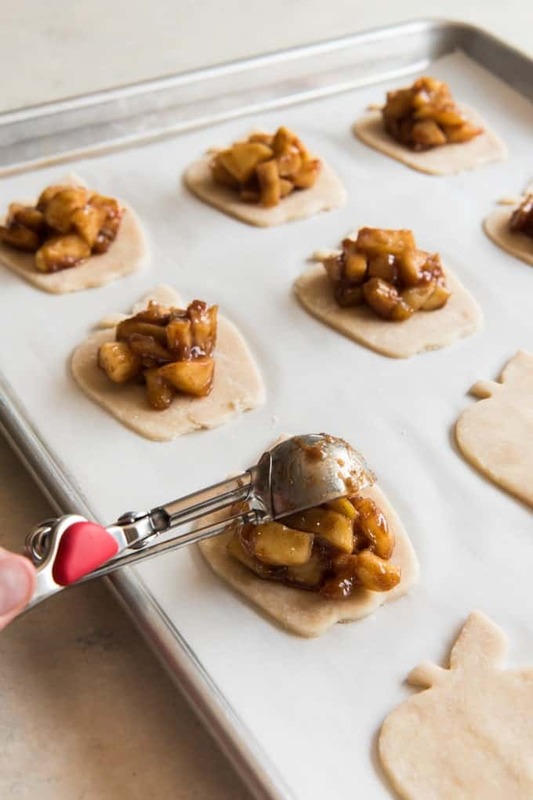 You could use any cookie cutter shape you want or just do circles if that’s easier and you don’t have an apple-shaped cookie cutter, but I love how cute the apple-shaped apple pie cookies look! Transfer to a parchment-lined baking sheet. 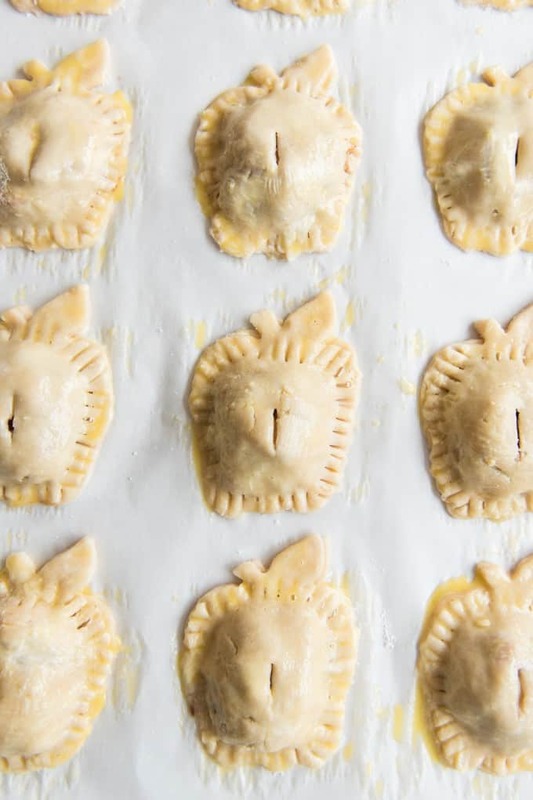 You definitely don’t want to skip the parchment paper here since there is a good chance that at least some juices from the hand pies will leak out, even though we did most of the work by cooking the pie filling in advance. Top each pie crust with 1 tablespoon of apple pie filling, mounding it in the center and leaving the edges clear. Gently place another apple shaped pie crust over the top and stretch it a little to try and meet the edges of the bottom pie crust. It doesn’t have to be perfect! They really just need to line up enough for you to crimp the edges together with a fork to seal up each apple pie cookie and keep the filling from leaking out. I also cut a slit in the top of each hand pie so they could vent while they cooked rather than risk any of them exploding on me. 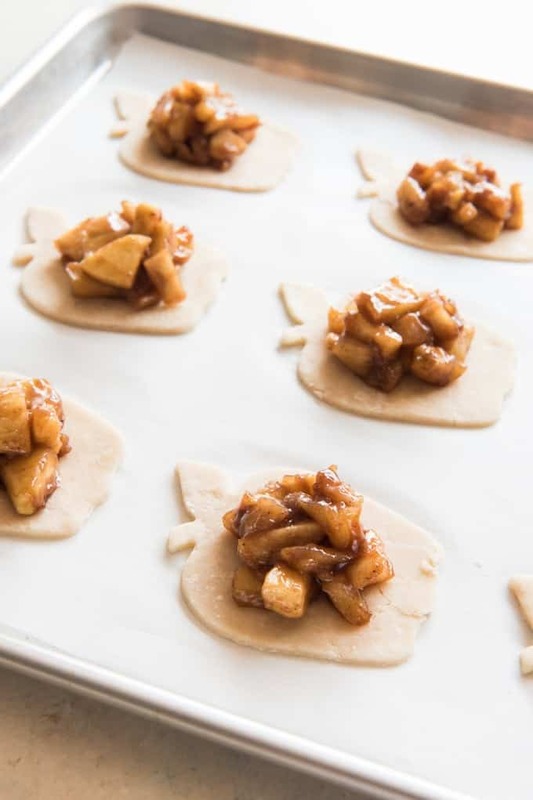 After a quick brush of egg wash and 20 minutes in the oven, you will have irresistibly cute and crazy delicious apple pie cookies ready to be glazed! 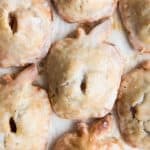 If glaze really isn’t your thing, you could always just sprinkle the little mini pies with cinnamon and eat them like that – they are scrumptious just plain! 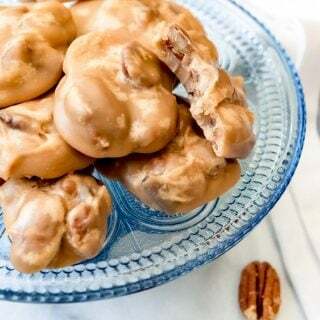 But the glaze is super easy and really takes these from pie to more of a cookie-pie hybrid. Whip up a simple glaze by just combining some milk and powdered sugar in a bowl, then drizzling over the top of each apple pie cookie. Or you could dunk them. Or use a pastry brush (which ended up being my preferred method). 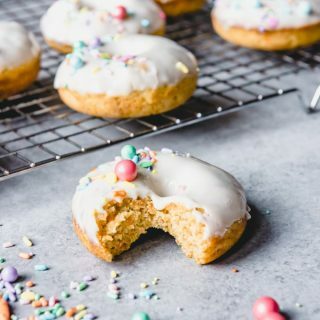 Let them set for 10 minutes so the glaze can firm up just a bit (longer if you are planning to transport them anywhere) and then just try not to eat the entire batch. Are you a fan of Apple Pie? 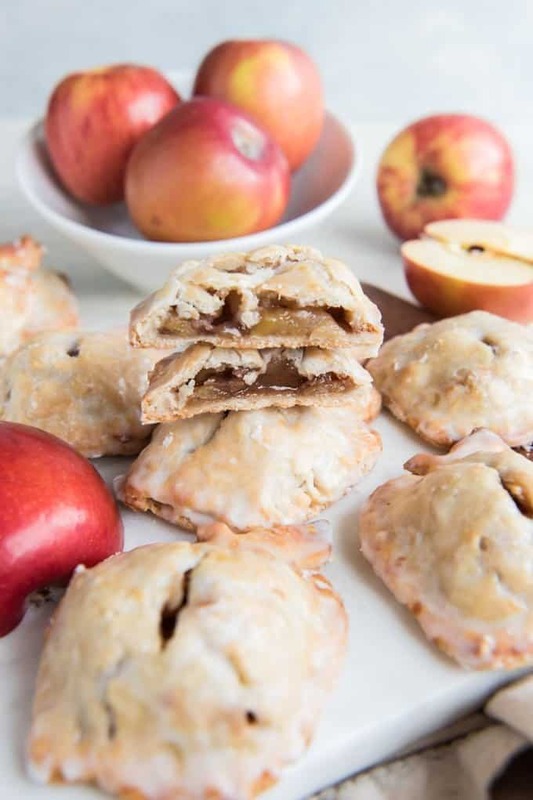 Check out these other Apple Pie recipes on House of Nash Eats! Gourmet Homemade Caramel Apples – there is an apple pie version included in the recipe box! Be sure to subscribe to the House of Nash Eats emails so you never miss a post! Prepare pie crust and refrigerate for 1 hour. Pull from fridge and let rest on the counter for 10 minutes so they will roll out more easily. Line a baking sheet with parchment paper. Heat the oven to 425 degrees. While the oven heats, peel, core, and dice the apples. Melt the butter in a large skillet over medium-high heat. When butter is melted, add the apples, brown sugar, cinnamon, nutmeg and salt, and cook for 5-10 minutes over medium heat, stirring occasionally, until apples have softened and released their juices. Sprinkle the flour over the apples and stir thoroughly to combine. Cook for 1 minute more to thicken the juices released from the apples, then remove from heat. Roll out 1 crust on a lightly floured surface and cut it into apple shapes with an apple cookie cutter, or use a large circle cutter. 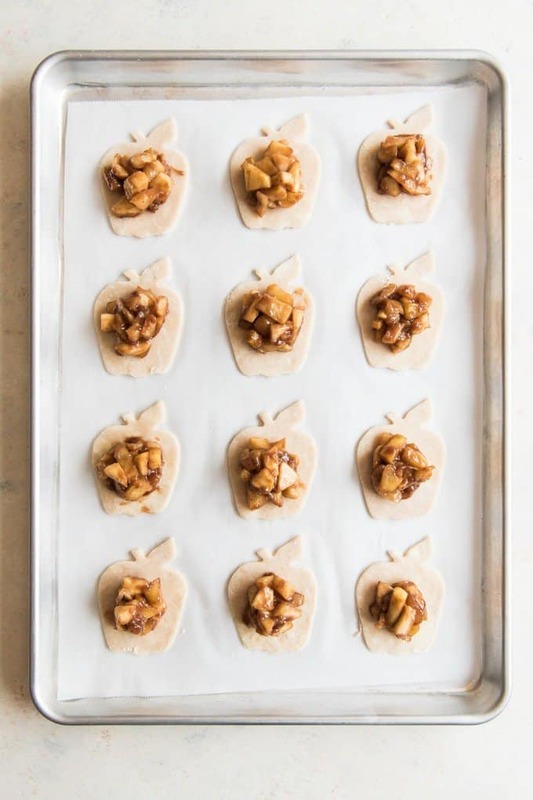 Gently transfer the apple-shaped pieces of crust to a parchment lined backing sheet. You may need to combine and re-roll scraps of pastry dough. Scoop 1 tablespoon of apple pie filling into the center of each apple crust, leaving space on the edges to seal with a second crust. Roll out the second crust on a lightly floured surface and cut it into apple shapes with the same cookie cutter or large circle cutter. Carefully place each top crust on each mound of apple pie filling and press the sides down to match the sides of the bottom crust. You may need to slightly stretch the top crust to reach the edges. 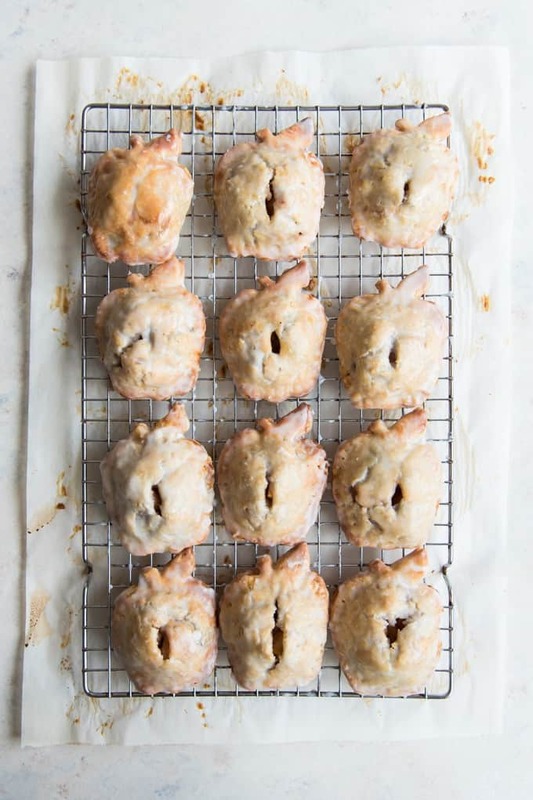 Use a fork to press around the edges of each hand pie for a good seal and a decorative finish. Make an egg wash by beating the egg in a small bowl with 1 teaspoon of water, then brush the tops of each hand pie with the egg wash using a pastry brush. Cut a slit in the dough on top of each hand pie. Bake at 425 degrees for 18-20 minutes, until the crust is lightly browned. While the hand pies are baking, prepare glaze by whisking together the powdered sugar and milk in a medium bowl. When pies are done, transfer them to a wire rack and brush with the glaze using a clean pastry brush. Alternatively, you could drizzle the glaze over the pies or even dip them into the glaze. Allow to cool and let the glaze set for at least 10-15 minutes before serving either warm, cold or room temperature. I like using Golden Delicious, Granny Smith, and Pink Lady Apples best in my baking, but Honeycrisp, Braeburn, Pippins, Jonathans, and Jonagolds are all good options as well! 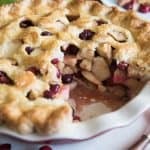 I always use this perfect pie crust recipe. Yum! Do you think they’d freeze well? 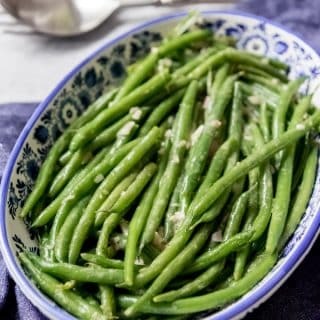 I’d love to make a batch and have them handy in the freezer for thr girls lunches. Hmmm, honestly, idk. I think they would freeze fine unglazed, but I’m not sure how the glaze would do as they thaw – maybe get a little sticky? If you try it, let me know! 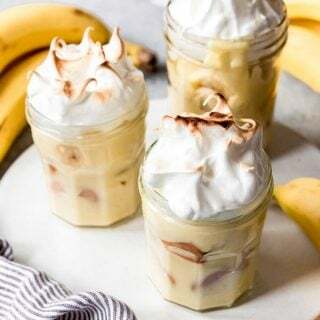 Awesome idea and recipe!! Looks amazing!!! Thank you! They are super fun to make too! 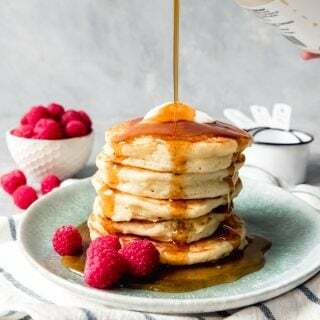 They are so so pretty and that glaze on top looks so good! Agree on -at least- the filling made from scratch! These are awesome! They remind me of getting Hostess Apple Pies with my great grandparents whenever we saw them. 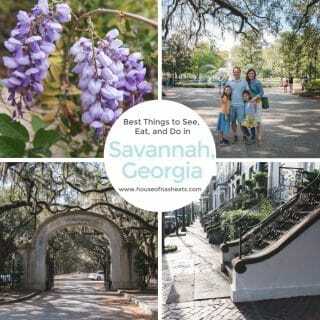 Thanks for sharing on the All Things Apple Celebrate 365 Blog Party! I love these cookies! Such a creative idea! Although some occasions call for store bought ingredients, I like take the time to make the homemade version. These look delicious and they’re SO adorable. 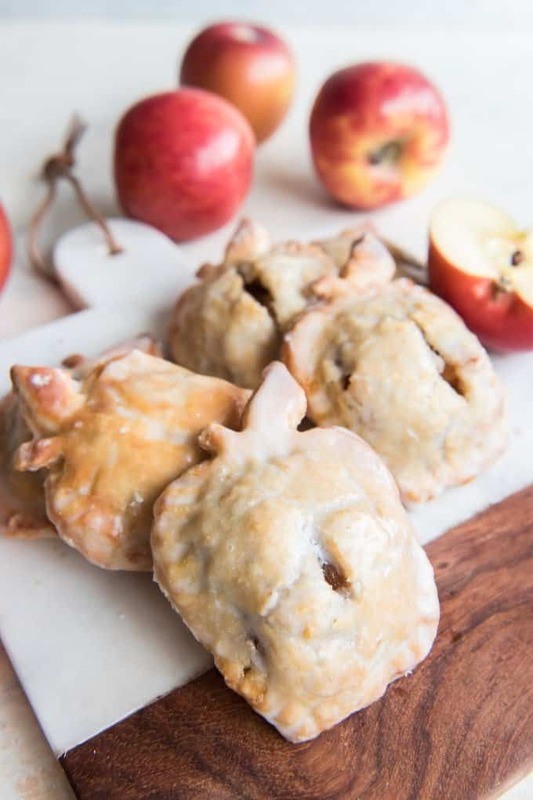 Omg these are the cutest little apple pies ever! What an amazing idea to use an apple shaped cookie cutter! Amy, these look SO cute!! And you’re totally making my mouth water right now. It’s bringing back childhood memories of those amazing Hostess pies! Such a great idea to cut them into the shape of an apple. Now they look like the perfect little treat. I could go a couple of those with a big mug of coffee right now.